What is the benefit opportunity for your company? At the CINCH RSNC we walk our talk. We are comitted to giving you maximum return on your investment. CINCH RSNC guarantees we will use, recommend, and promote your products to our entire membership. We guarantee extensive exposure at World Finals. 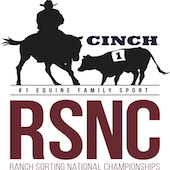 CINCH RSNC is dedicated and loyal to our sponsors. In the years to come, our founding sponsors will be given first priority in all CINCH RSNC marketing opportunities… now and in the future. We will provide you with prime banner logo ad on our home page of the CINCH RSNC website with a link. Your company’s name and product information will be announced repeatedly at World Finals. Our sponsors are welcome and encouraged to set up a booth to display and market their products at any of the hundreds of CINCH RSNC sanctioned events throughout the United States. Marketing banners provided by the sponsor will be prominently featured in the arenas at all CINCH RSNC sanctioned events, reaching thousands of energetic contestants and excited spectators. We will provide opportunities for your company’s local and/or national representative or dealers to present awards to the winners at the CINCH RSNC World Finals.